Hey everyone...Travis back with some information about some great Tampa Bay entertainment. For the first time in the Tampa Bay area, Feld Motor Sports, Inc. will present two Advance Auto Parts Monster Jam® events at Raymond James Stadium. After selling out for the past eight years in a row (since 2002), and turning away thousands of fans that wanted to see the show but could not get tickets, Feld Motor Sports is offering Bay area fans another opportunity to see and feel the excitement of Monster Jam. 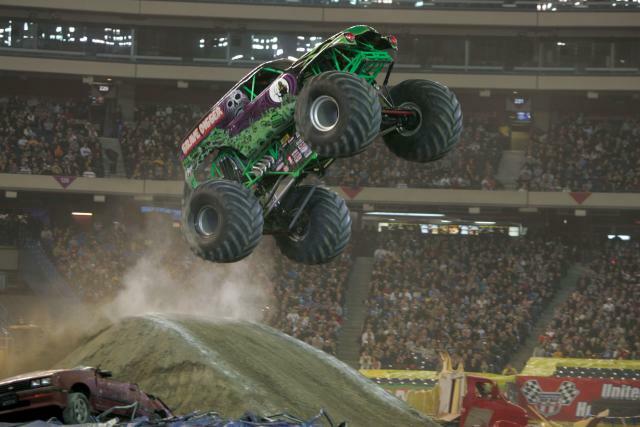 Raymond James Stadium will erupt on both nights, January 23 and February 6, when 1,500 horsepower, 10,000-pound Monster Trucks compete in Side-by-Side Racing, as well as the fan-favorite Freestyle competition, where trucks will go one at a time and have 90 seconds to awe the crowd with huge big-air jumps, wheelies, truck spinning donuts, and the destruction of cars, vans, buses, and even motor homes. Again, the dates are Saturday, January 23 at 7:30pm and February 6 at 7:30pm and tickets for both events are available at all Ticketmaster outlets, charge by phone at 800-745-3000, or online at www.ticketmaster.com. And of course tickets will also be available at the Raymond James Stadium Box Office beginning January 18. Oh, did I mention that tickets start at $15...now that&apos;s a great deal for some awesome entertainment. For more information, just visit www.monsterjam.com. We&apos;ll post some more updates as they come along, but keep checking back for more great things to do in Tampa Bay and other Tampa Bay area events.